The Department of Art at Youngstown State University offers courses that satisfy major requirements in art for the degrees of Bachelor of Fine Arts, Bachelor of Arts and Bachelor of Science in Art Education. These degrees may be earned in eight semesters if students average 16 hours per semester, with the exception of art education, which requires nine semesters. The Department also offers a Master of Arts in Art Education degree requiring 35 semester hours and a Museum Studies Certificate requiring 18 semester hours. Students wishing to transfer to YSU should consult our transfer student information under Transfers. The requirements for curricula and for graduation are in accordance with the published regulations of the National Association of Schools of Art and Design. For the Bachelor of Fine Arts degree, the programs in studio art are designed to familiarize the student with the basic concepts in art and the language of visual form. Concentration is on the development and involvement of the student with the processes and practices of art. A minimum of 127 semester hours is required for the B.F.A. degree. Most B.F.A students require four and a half years to complete the degree. Passing Art 1503, Foundation Portfolio Review, is required at the completion of the foundation sequence to continue in the program. The first year foundation curriculum provides the groundwork and preparation for subsequent coursework and culminates with the Foundation Portfolio Review. In addition, B.F.A. students are required to exhibit in a senior show at the John J. McDonough Museum of Art. For the Bachelor of Arts degree, the art history major is required to complete a minimum of 40 semester hours in art history beyond the freshman level, plus 6 hours of studio art electives. In addition, art history majors must complete 11 semester hours in a foreign language to include upper division. A minimum GPA of 2.5 is required to transfer into a Department of Art degree program. Students majoring in art who wish to qualify for licensure in pre-K-12 art are required to complete a minimum of 66 semester hours, at least 15 of them in art history. These students, after completing two years of study with a point average of 3.0, may apply for admission to the Beeghly College of Education. (Other requirements for admission are listed under the College of Education section.) No minor is required for the special certificate. Students interested in the Master of Arts in Art Education degree must complete a minimum of 35 semester hours of graduate coursework consisting of a graduate studio core, an art education core, a graduate research course, an art history elective and a capstone research project in the form of either a written thesis project or a graduate studio exhibition. As a culminating experience, students must complete either an exhibition combined with a professional talk and an artist’s statement, or an oral examination based on a written thesis. Not all emphases or programs are available in the evening. Students seeking a degree in art through an evening program should consult with the department chair to determine if it is possible. 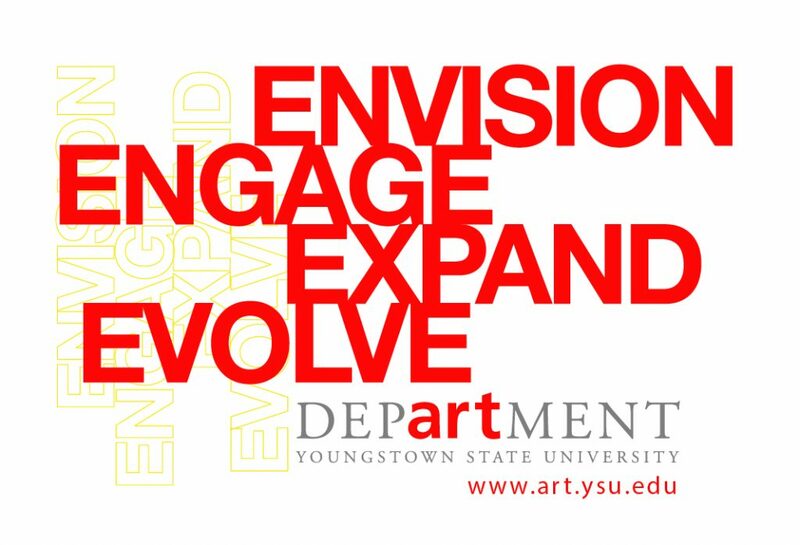 The mission at the Department of Art at Youngstown State University is to provide a teaching and learning environment for the development of skills, concepts and sensitivities essential to professional artists, designers, art educators, and art historians. This mission and the cultural enrichments that it entails are directed at the entire student body and at the community as a whole. This mission is accomplished within the context of a local multicultural society, thereby demanding special concern for the dissemination and sensitivity to a wide cultural heritage. The Department also recognizes the rapid changes occurring in technology and is dedicated to developing leadership in the application of technology to the arts. It is the commitment of the Department to address both traditional issues and innovations in its educational environment. The commitment to excellence in teaching, scholarship and service takes place within a wide array of disciplines at the undergraduate level. Majors are offered in art education, art history, and studio art. The latter includes concentrations in digital media, graphic design, painting, photography, printmaking, and 3-dimenional studies (sculpture/ceramic) as well as an interdisciplinary studio arts course of study. Degrees offered are the BA (art history), the BFA (studio art), and the BSE (art education) in conjunction with the College of Education. The Department is committed to enhancing the intellectual and cultural climate of the University and community by presenting public activities and producing graduates with firm cultural and intellectual grounding, developed creativity, and problem-solving abilities. There is a strong recognition in the Department of the role of responsible, productive, and creative individuals in society and the place of the arts in determining the quality of life in a multicultural society. The Department of Art continues to offer a curriculum that balances creativity with traditional skills and emerging technologies while also focusing on contemporary issues and historical perspectives presented with varied methodologies. In support of this and the broader goals of the College of Fine and Performing Arts, the Department of Art is committed to the general standards for all undergraduate degree programs in art and design as expressed by our accrediting agency, the National Association of Art and Design (NASAD). Youngstown State University Cost of Living: 28% Lower than the National Average; 16% Lower than the State Average With its small-town feel, unique history, lush green spaces, and gorgeous collection of historic buildings, Youngstown was recently named the best college town in the Midwest (by America Unraveled). Forbes.com even ranked Youngstown as the fourth best city in the U.S. in which to raise a family, citing the town’s low crime rate and great cost of living. An active local sporting scene offers plenty of opportunity for athletes and sports fans alike, while a community theater, full events calendar, and walkable downtown area make for great pastimes. Food, healthcare, transportation, and entertainment costs are all less than the national average, while housing costs of only 26% of the U.S. median make it easy for students to live well in off-campus homes and apartments. The Department of Art at Youngstown State University began in 1935 as an initiative of Howard Jones, the first president of the University. He supported the concept that aesthetics and art play a major role in the development of the individual in society. Howard Jones appointed Margaret Evans, former director and curator of the Butler Institute of American Art, to teach and direct the development of art courses in the curriculum. Evans began to establish a curriculum leading to a career in art education in elementary and secondary schools. During this period of development, art classes were held at the Butler Institute of American Art, the Mill Creek Park art museum and various locations on the campus, ranging from private mansions along Wick Avenue to the World War II army barracks built on the campus. In 1939, the Bachelor of Arts degree with a major in art was offered. However, World War II interrupted the development of this major. Immediately following the war, the G.I. Bill of Rights stimulated rapid growth in student enrollment at the College and along with that, an increase of first generation college students. In 1947, an official major in art was established and Margaret Evans became the first chairperson. David Skeggs was appointed as the first full-time instructor in the new program and later became chair after Margaret Evans’ retirement in 1953. In 1958 the department moved into its first permanent home in West Hall, a carriage house on the main campus and in 1976 moved to its present location in Bliss Hall. An important expansion of the department’s programming came about with the opening of the McDonough Museum of Art in 1991. Through the generosity of Dr. John J. McDonough, a new facility was created for the exhibition of work by students; faculty; and local, regional, and national artists. A prominent local resident and collector of American impressionist paintings, Dr. McDonough donated the auction proceeds from the painting Gloucester Harbor by Childe Hassam to establish a building fund for a university art museum. The McDonough Museum provided opportunities that were never before available to students, from fine arts majors exhibiting their own work to advanced art history students curating exhibitions. The first senior shows were begun there in 1992. In 1995, the Butler Institute of American Art received a gift of $1 million dollars from local philanthropist Eleanor Beecher Flad and her family. This gift formed the basis for a cooperative project between the BIAA and the YSU Department of Art when the state of Ohio designated an additional $2.5 million to create the funding for the Beecher Center for Art and Technology. Completed in 1999, this 19,000 square foot facility houses a high-technology auditorium, exhibition spaces for new-media artworks, research and conference areas and studio space for YSU students and visiting artists. In 2003 the department opened an 18,000 square-foot state-of-the-art studio building connected to Bliss Hall, which contains production facilities for painting, metal fabrication, bronze and iron casting, hot glass, woodworking, and three-dimensional computer visualization. The $3.3 million-dollar building expanded the Department of Art’s production facilities to over 60,000 square feet of specialized media labs. Since 1935, the department has grown to over 30 full-time and adjunct faculty members who teach 400 art majors studying two-dimensional design, three-dimensional design, drawing, painting, printmaking, photography, ceramics, sculpture, art education, art history, graphic design, and digital imaging. The exceptional arts programming by the YSU Department of Art is acknowledged by full accreditation by the National Association of Schools of Art and Design, an organization whose membership includes 309 schools out of approximately 2,500 art departments nationwide. The City of Youngstown, named for John Young, was incorporated in 1867. Mr. Young purchased approximately 15,000 acres (the entire township) for slightly more than $16,000 in 1797 from the United States Government through the Connecticut Western Reserve Land Company. By 1798 more families were settling in the Mahoning Valley between the Mahoning River and Mill Creek Park. By 1820, Youngstown’s population began to grow, as well as industrialization, with the opening of the Pennsylvania and Ohio Canal. This waterway, abandoned in 1872, was replaced by railroads thereby attracting more people and industries in ever increasing volume. In 1877 the canal was officially closed and the property sold. The Railroad and industry purchased most of this property. In 1876, the Mahoning County Seat was moved from Canfield to Youngstown, with the city’s population growing to 33,220 by 1890. The first steel company was established in the Mahoning Valley, changing Youngstown industry from iron to steel which was the forerunner of miles of steel plants in the valley. The Youngstown Historical Center of Industry and Labor, built in 1986, houses the exhibit By the Sweat of Their Brow: Forging the Steel Valley which shows the impact of the iron and steel industry on this area. Youngstown is also known for its dedication to the arts. In 1975, the Youngstown Area Arts Council was established to support all visual and performing arts in the area. The Butler Institute of American Art, one of the nation’s most unique museums, is located north of the downtown area near Youngstown State University. Also in the downtown area is Edward W. Powers Auditorium opened in 1931 by the Warner Brothers, one of the giants of the motion picture industry. You can learn more online about the Youngstown area thru Wikipedia, the free encyclopedia. Or logon to the Mahoning Valley Historical Society for more history of the area.